Samsung Display is the global leader in OLED display technology. The previous generations of the Galaxy Note and Galaxy S devices were all praised for their gorgeous screens. The Galaxy Note 9 display takes things to a whole new level, proving once again that Samsung remains the king when it comes to display technology. Just days after the Note 9 unveiling, folks at DisplayMate have published a full breakdown of the Galaxy Note 9 display following an exhaustive testing. The independent testing firm declared that it’s the best smartphone display they have ever tested. So, if you want to buy a phone with an incredible display right now, the Note 9 is up for pre-order. It will start shipping on August 24th. DisplayMate praised the Note 9’s color accuracy, brightness, and viewing angles. They ran a series of tests to assess its color accuracy, brightness, contrast, OLED spectra, color intensity, display power, screen reflections, and more. DisplayMate gave it their highest ever A+ grade with the Best Performing Smartphone Display award. The Galaxy Note 9 display set a new record for absolute color accuracy with 0.5 JNCD. It makes the Note 9 screen almost indistinguishable from perfect. In fact, it’s even better than the UHD TVs, computer monitors, laptops, and smartphones. Its brightness is also 27% higher than last year’s Note 8, and contrast is 32% higher at peak brightness levels. Samsung’s newest phablet has the lowest ever screen reflectance of 4.4%. It has a full 100% DCI-P3 color gamut, and is capable of playing the high-end 4K video content. 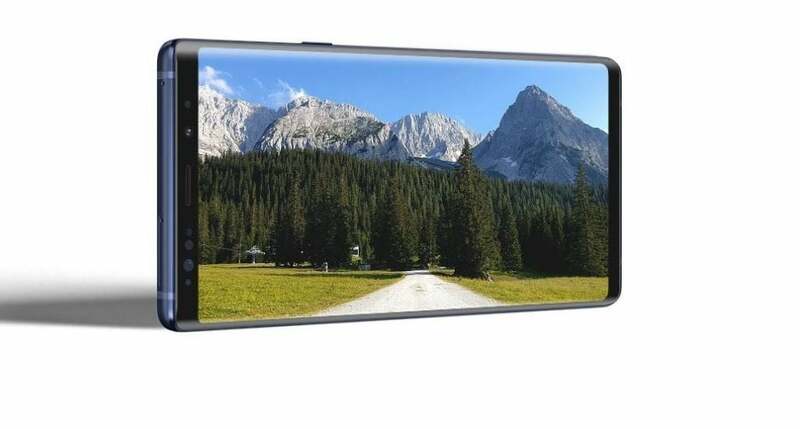 The Korean electronics heavyweight has also added a video enhancer in the phablet to offer HDR-like Expanded Dynamic Range for video content that lacks HDR coding. DisplayMate pointed out that the Note 9 comes with a Night Mode that includes blue light filter. It lets users adjust the amount of blue light emitted by the display to enhance viewing in the dark, which leads to better sleep. The phone’s gorgeous display is protected by Corning’s Gorilla Glass 5. The Galaxy Note 9 display measures 6.4-inch diagonally. It has a Quad HD+ resolution of 2960 x 1440 with 516ppi pixel density. It will be interesting to see how long the Note 9 retains the title of the world’s best smartphone display considering the iPhone X Plus is just around the corner. The iPhone X Plus’s OLED screen will also be made by Samsung Display, but Apple’s expertise in fine-tuning color reproduction could give it an edge over the Galaxy Note 9. Are you buying the Note 9? The Note 9 is a pretty expensive phone. In fact, it costs even more than the iPhone X. Samsung’s latest phablet starts at $999.99 for the base model with 6GB RAM and 128GB storage. If you go for the 8GB RAM model that offers 512GB storage, you have to shell out $1249.99. Fortunately, both variants offer a microSD card slot with support for up to 512GB external storage. The Note 9 is powered by Exynos 9810 or Snapdragon 845 depending on the region. Both the chips are made using 10nm manufacturing process. The phablet retains the USB-C port and the 3.5mm headphone jack. It also offers an IP68 rating for water- and dust-resistance. It packs a giant 4,000mAh battery with wireless charging and fast charging support. The Note 9 runs Android 8.1 Oreo with Samsung’s custom Samsung Experience skin on top. We expect it to receive the Android 9.0 Pie update later this year. One of the biggest highlights of the Note 9 is its upgraded S Pen that comes with Bluetooth Low Energy. It allows users to perform a variety of Bluetooth actions such as the ability to control music playback, Gallery, apps, use it as a camera shutter and as a remote control during PowerPoint presentation. The Galaxy Note 9 camera remains similar to the Galaxy S9 Plus, though it gets a couple of AI features. Its rear camera setup consists of a 12MP Super Speed Dual Pixel lens with variable apertures and OIS, and a 12MP telephoto lens that offers 2x optical zoom and 10x digital zoom. It has a Scene Optimizer feature that analyzes the scene and optimizes the color contrast, saturation, brightness, and white balance to capture the best possible photo. Another feature called Flaw Detection lets you know immediately after you click a picture if something is wrong with the photo. It helps you take another photo before losing the moment.